Truly a unique patented roofing, siding, contractor bar. Drop forged from fine tool steel, one end has a thin blade with a 2 1/2 in. fulcrum giving it a higher lift than other bars. 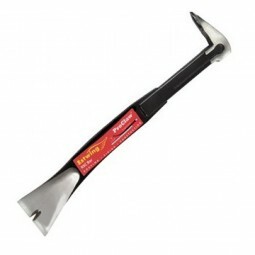 Ideal for removing shingles, downspouts, gutters and nails with ease. The other end has a Japanese pattern nail puller with rounded head to improve leverage and pull even the most difficult nails.